I f you have found this guide helpful, please consider making a donation. As a volunteer in the genealogy world I help others but do not charge for my services. Thank you. A word about Ethnicity estimates in general. Being an amateur genetic genealogist I have learned a lot from other helpful people and so must pass on their words here. I have been told to take all of these estimates with a large grain of salt. Some people do not think they are very good, partly because the science is new, or the samples used to compare to may not be what’s really required (like with Native American DNA) or some may just not like what the estimates show. Native DNA is still problematic in that the tribes people in the US generally want to know about have not tested or have not made tests public, and many tribal people today are a great mixture of Native and other DNA and so may not show as much Native as they think. Also tribes that have tested tend to have been chosen for their remoteness and in North America, there are no remote tribes left. So the DNA samples that are most often used are South American, Siberian etc. Frequently some people of some tribes in North America are showing up with East Asian DNA. This can be a sign of Native ancestry as can Siberian, especially if you have no other Asian ancestry. So again, all of these are reasons to take these with a grain of salt. On the other hand I have found them to be extremely accurate and very helpful in making solid connections where I have already had some paper trail. So please take this into consideration. Please note as far as I understand it, some of these tests were made specifically to look at people in a specific area of the world-for example MDLP is for people in Lithuania and HarappaWorld is for people in South Asia. You CAN use these tests to look at your own results, especially if you know you have some DNA from those areas. For example a mostly white person with a small amount of African DNA can use Ethiohelix (K10 + French) to look more closely at their African bits, while disregarding all of the white DNA as “French” in that test…Specific tests within the projects can help look at things like Asian, Japanese, African, and Ashkenazi. But please remember, this is like looking at the same scene (your DNA) through different colored glasses. The result is still the same but the interpretation “language” may differ. You must already have your raw DNA input into Gedmatch and have received a kit number. Frequently it will let you have a number and do simple comparisons immediately after upload, but may take several days to “batch process” so you can run “One to Many” comparisons. You can also Google how to do this from 23andMe, FTDNA etc. 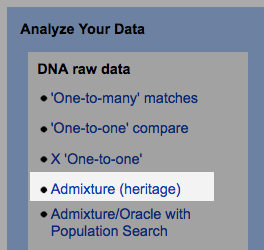 From the homepage click on the “Admixture (heritage)” link in the “Analyze Your Data” section of the middle right (blue) column. This will take you to a page with the heading “Admixture Utilities”. 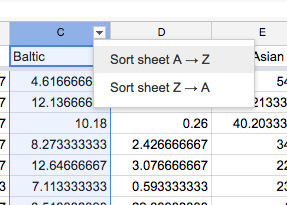 From the drop-down menu, choose the project you would like to use to analyze your data. A simple one to begin with is Eurogenes because most people have some European DNA and this uses simple categories for ethnicity. To start with you want to leave the default button on “Admixture Proportions”. This will give you the classic “Pie Chart”. Enter your kit number in the first box. Leave the default at Eurogenes K13. It should take just a moment or two for your Pie Chart to come up. Go to the letter above the Baltic column and to the right of the C click the drop-down arrow. Sort from Z – A. 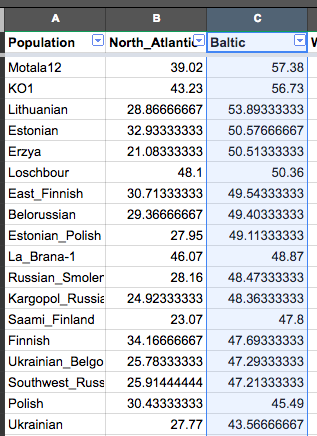 What you will see is now the entire list, ordered by which population occurs most in the Baltic category. NOTE: This does not mean that your ancestor is Motala12 or Lithuanian. They MAY BE something lower down on the chart but all this chart is saying is that TODAY the highest concentration of the DNA that you show that they can identify as “Baltic” is found in Motala12, KO1 and Lithuania. The highest percentage is the most likely to be what your DNA is. It can vary drastically because no one stays in one place anymore and haven’t for hundreds if not thousands of years. 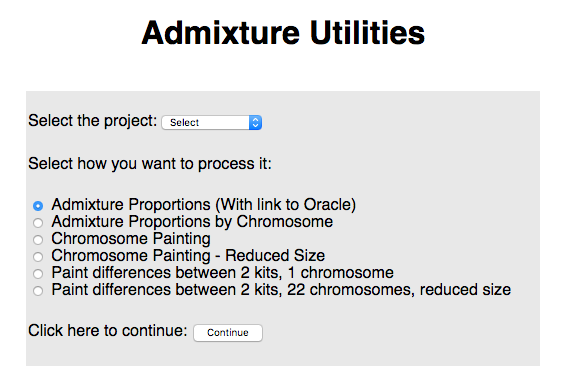 Click the button that says “Admixture Proportions by Chromosome”. Use Eurogenes again. This will take a little longer but what you will end up with is a chromosome by chromosome breakdown of what DNA you have. Something may be so small in totality that it did not show up on the pie chart, but you may still see it on individual chromosomes. On the examples given (same kit number), notice South Asian does not appear on the pie chart, but appears on several chromosomes in the detailed breakdown. 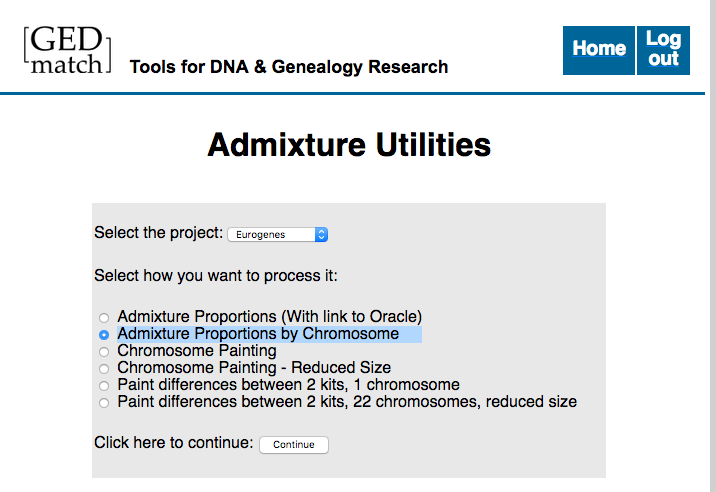 This can help you to track down ancestors with particular ancestry, using Chromosome painting and Matching Segment Search. (Future posts for another day). These are but a few things you can accomplish on Gedmatch. You can’t hurt this website, so once you get your kit number, play around, click every link and see what happens…That’s exactly how I learned. And, by the way, Gedmatch is run by awesome people who do a lot of work for little to no money and there’s no advertising and no big annual fees. So please scroll to the bottom of the home page and send them a donation or sign up for a monthly one. $10 a month with get you use of Tier 1 tools. Reblogged this on Redbone Nation.